Between 1960 and 1970, I was a parishioner of St Joseph’s Catholic Church which is located in Stamford Hill Road and the property included the corner, Argyle Road and Stamford Hill Road. It was then a thriving parish. It, at one time, also had a small church at the back of the property called St. Paul’s which was a separate entity and served mainly the Black community. In the early 60s, the church bought a property in Argyle Road directly opposite the church and built there on a magnificent church hall facility which included a fully functional stage, a large hall, a projection room and a fully fitted kitchen . Adjacent to the church in Stamford Hill Road was St Agnes School which was a junior school for both girls and boys. The school was run by the Holy Family Sisters. From a Convent school magazine, I have ascertained that St Agnes School dates back to 1905. Whilst a St Joseph’s parishioner, I had learned that the St Joseph’s Church had actually been moved to where it stood at some point in its existence from another location in Durban. As I understood it, the church had been relocated and rebuilt brick for brick. Recent posts on FAD about St Joseph’s School and my reading of a book by Dr. J. B. Brain called “Catholic Beginnings in Natal and Beyond” ( Published by T.W. Griggs and Co. 1975 now out of print. ) recalled my memory of the church in Greyville being relocated so I started gathering facts and I think I have managed to put the story behind the relocation together. A bit of the background history of Catholicism being established in Natal. The initial party sent out from France were Missionary Oblates of Mary Immaculate (OMI). The founder of the order, Bishop Eugene de Mazenod , Bishop of Marseilles, responded to a call from Rome to initiate missionary work in Natal as well as to minister to the Catholics living in and around Durban and Pietermaritzburg. The first group consisted of Bishop Jean Francois Allard, the designated Vicar Apostolic for the Eastern Vicariate which included Natal, Father Jean-Baptiste Sabon, Father Lawrence Joseph Dunne, a deacon about to be ordained priest, Julian Alphonsus Logegaray and a lay brother, Joseph Compin. The missionaries left Marseilles on November 13th 1851 and arrived in Cape Town on January 19th 1852. They had to wait 6 weeks before they got a passage to Port Natal on the cutter, GEM, leaving on 26th February 1852 and arriving at Port Natal on March 15th 1852. A few days after the party’s arrival, Bishop Allard rented a small house in Smith Street. He turned the largest room into a temporary chapel and celebrated his first Mass on March 19th 1852. ( March 19th in the Catholic Church is celebrated as St Joseph’s feast day; St Joseph , spouse of the Blessed Virgin Mary and Patron of the Universal Church. I would venture to say Bishop Allard knowing this would have borne it in mind when a proper church was to be built and dedicated in the future). Two years prior to this, a Father Thomas Murphy had been sent to Natal by the Vicar Apostolic for the Cape, Bishop Devereux on a 6 month visitation. He was investigating the number of Catholics in and around Durban and Pietermaritzburg and as to the viability of opening missions to the Zulus. He approached Governor Pine with regards to allocating land for churches and schools in Durban and Pietermaritzburg. Land was allocated in Pietermaritzburg and a verbal promise made that land in Durban would be made available. On arrival Bishop Allard pursued the matter of land being allocated to the Church and this was finally acceded to. Father Sabon was appointed Parish Priest of Durban. A rudimentary chapel was opened in 1853 but soon needed repairs. In 1861 a bell was acquired and a belfry was added to the building. Father Sabon then embarked on raising funds to build a proper church and on 29th October 1865 with a large congregation attending, St Joseph’s Church in West Street was opened. I would surmise that Bishop Allard recalled his first Mass was said on St Joseph’s feast day and hence put Durban’s first church under his patronage. The first clue about the location of the original St Joseph’s Church lies in the actual dust jacket of the book I mention above. 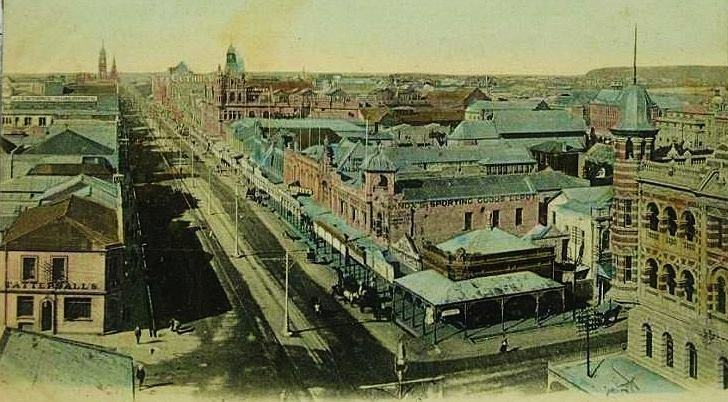 It shows an old painting of West Street, Durban, with a Church on the right hand side and in the distance on the left hand side, the former old City Hall, now the Post Office. Significantly, attached to the church is a bell tower which looks very similar to the bell tower presently attached to the existing Emmanuel Cathedral in Cathedral Road. 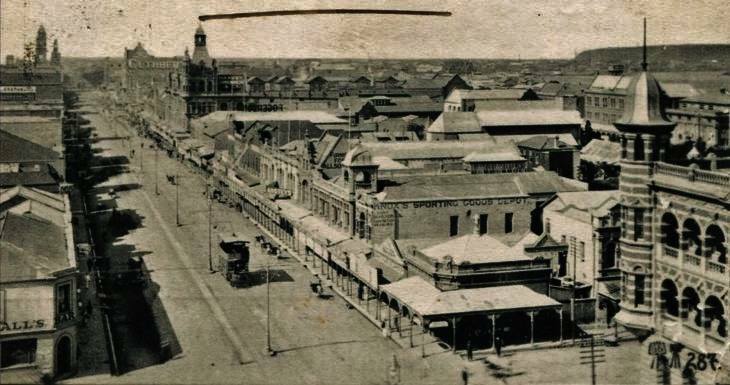 The dust jacket states: “West Street Durban in 1890 with the spire of St Joseph’s Church in the foreground. The original painting is in possession of Maritzburg College to whom it was presented by R.D. Clark, a former headmaster.” The painting therefore refers to the original St Joseph’s which was somewhere in West Street and nowhere near where the Cathedral is today. The next clue came from the book, Origin of Durban Street Names written by John McIntyre. These are notes given for Cathedral Road : “runs from West Street to Queen’s Street. Takes its name from the Roman Catholic Cathedral built there on the removal of St Joseph’s Church from the corner of West Street and Grey Street ( now Broad Street) to Stamford Hill Road about 1904-1905”. This ties in perfectly with the dust jacket painting. This site would therefore have been the original one offered to Father Murphy. In the book it is mentioned that Bishop Allard purchased adjoining ground and it can be surmised that this was towards the Smith Street side because of the existence of Convent Lane. The notes written up for Convent Lane read thus: “runs from Broad Street to Russell Street – situated between the Convent of the Holy Family and the Roman Catholic Church of St Joseph, the latter having been transferred to Stamford Hill Road in the 1900s when the Emmanuel Cathedral was erected”. From another source, I have ascertained that the Convent of the Holy Family Sisters in Convent Lane in Durban dates back to 1875/1876. This would have been the time when the Sisters started expanding following their successes in Lesotho. The Holy Family Sisters were sent out to help the Oblates with the mission they established in Roma, Basutoland. After two failed attempts to establish missions in southern Natal, the Oblates turned to Basutoland where they had great success. Following this success the Holy Family Sisters spread through to the main centres in South Africa. The first school the sisters established in Durban was St. Joseph’s Primary School. This dates to 1876 and the school fronted Smith Street. The sisters convent was behind the school and one assumes the convent adjoined the church. This indicates that the area between West and Smith Street fronting Broad Street belonged to the Catholic Church. Surprisingly, Maris Stella was not the second school opened by the sisters in Durban. In fact St Xavier’s School on the Bluff for African children was opened in 1878 followed by St Anthony’s Indian School which was opened in 1888. Maris Stella’s opening date is given as 1899. By 1914, St Joseph’s School had outgrown itself and the Convent School in St Andrew’s Street was opened. St Agnes School which dates back to 1905 ties in with the relocation of St Joseph’s Church. The property bought in Stamford Hill Road could accommodate both a church and a school and this appears to have been the plan. St Agnes School by the way, is bounded by de Mazenod Road . The notes read : ” Runs from Stamford Hill Road to Oblate Road. This road derives its name from the Roman Catholic Church of St Joseph. Charles Joseph Eugene de Mazenod, Bishop of Marseilles (died 1861), was the Founder of the Congregation of the Oblates of Mary Immaculate., of which Congregation the priests officiating at St Joseph’s Church have generally been Oblates. Oblate Road also named for the order, runs from De Mazenod Road to Argyle Road”. Bishop Allard remained as Vicar Apostolic until 1874 when he was replaced by Bishop Charles Constant Jolivet who arrived to take up his post in Durban on 4th March 1875. During the years 1878-1881 Father Sabon put all his efforts into building a new and larger church. It is surmised that this replaced the church that had been opened in 1865. 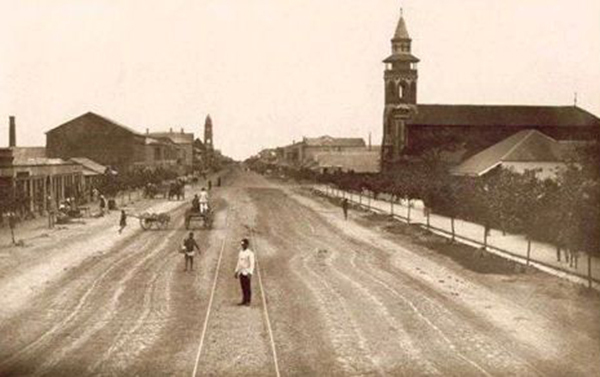 On November 13th 1881, Bishop Jolivet officially opened the new St Joseph’s Church in West Street. The rigours of raising funds and the building of the new church took its toll on Father Sabon. He died on January 13th 1885, at the age of 65 and having spent 33 years in the parish of Durban. He was buried in a small mausoleum in what was then the Catholic part of the West Street Cemetery which is now adjacent to the Cathedral. The siting of St. Joseph’s Church in West Street did not fare well as increasing noise and the growing business area around it, worked against it. By the turn of the century, Bishop Jolivet had initiated a move to build a Cathedral to replace St. Joseph’s Church. To raise funds for its structure it was decided that the land where St Joseph’s Church stood be sold, the proceeds going to the Cathedral building and the relocation of St Joseph’s Church to the quieter suburb of Greyville. I would assume the area sold off was the corner block on West Street and Broad Street. Convent Lane would have been the boundary line, as the Convent remained intact along with St. Joseph’s School after the Church was demolished. Eventually St Joseph’s School closed and was demolished along with the Sisters’ Convent when the property was sold and became Durdoc Centre. This occurred in the late 60s if I recall. The Cathedral foundation stone was laid in 1902 and the Cathedral was opened in 1904. The St Joseph’s Church in Greyville is dated as being 1904 so that ties in with its demolition and the building of the Cathedral. Next door to the Church, St Agnes School was built and this dates to 1905. I am not sure when the Greyville St Joseph’s changed its name to Sao Jose and became a church mainly for the Portuguese Catholic community. It would probably have been when the “new” St Joseph’s was built in Florida Road in 1975. The area around the old St Joseph’s had changed completely with Stamford Hill Road which was once totally residential transformed into a business area. The Florida Road St. Joseph’s becomes the third church with this name and presently takes over the mantle of the original 1852 St Joseph’s. For some time I have been looking for an elusive picture of St Joseph’s Church as it was in West Street. This prior to it being demolished and moved to Greyville. Thanks to Richard van Wyk who posted this picture on the FB site Greyville.. the greatest place to grow up in here is a copy of it. The bell tower is very similar to the present Cathedral one. Note the single tramline which at that stage was horse drawn. Not too clear from the picture but the church stood on the corner of West and Broad Street. 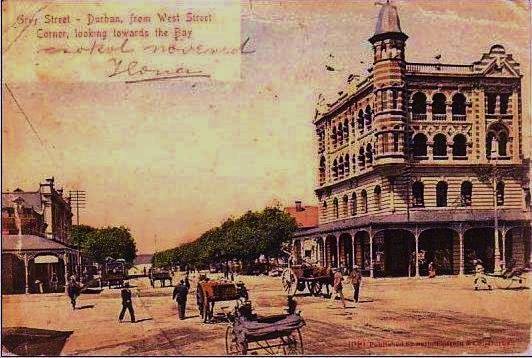 On another FB Site remembering old Durban, a picture of a building was posted which I was not familiar with but was reported to be of the corner of Broad and West Street. It was called Atlantic Building. 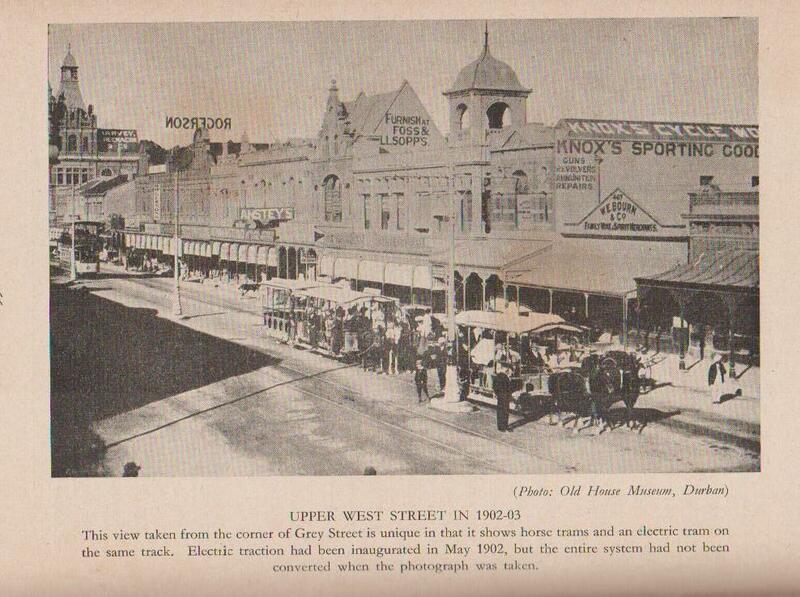 I could not recall it but looking at the picture it showed the upper end of West Street, namely the corner of Broad and West Streets. The coloured postcard was posted first but was not too well defined. However the poster had a black and white print as well and this was clearer and showed the buildings in better definition. The Atlantic Building is on the bottom right side and looked an attractive building. Well its locale triggered off the memory that this was the site of the original St Joseph’s Church in West Street. As in the history above it was “dismantled” and moved to Greyville when the new Cathedral in Cathedral Road was planned to replace it. The property was sold off and this is the building that replaced it. Further comment made me look into the book, Durban, a pictorial history and I found a picture showing St Joseph’s Church with its bell tower in the distance. Although not specifically mentioned in the book, the Atlantic Building is also featured on the same page (top right). I also found a picture of the same area but looking towards the east which ties in with the other pictures. I have yet to find a picture of what the St Joseph’s Church looked like from a frontal view. It will crop up some day. The postcard that started the discussion. The Atlantic Building on the right. The black and white copy of the above postcard. Note the corner building opposite the Atlantic Building. Many years later this became the Polar Bar with the verandah roofing removed. It was the spot where ice creams were bought when people strolled through town on Saturday or Sunday evenings window shopping. The Atlantic Building looking down Broad Street towards the Esplanade. This was the site of the St Joseph’s Church. Possibly the roof of the St Joseph’s School or the Convent in the background. Looking up West Street and St Joseph’s Church and its bell tower in the distance. Note how the bell tower was copied to an extent when the bell tower was built on to the Cathedral. The Atlantic Building on the top right. Looking down West Street note Colombo Tea and Coffee building with the Knox ad on its side. It was interesting putting this history together. I do remember St Joseph’s school when it was till in existence. However I never set foot inside the school so only knew the frontage. What I do recall though is that the end of the convent chapel faced Broad street and was semi-circular and had a small dome to it. This would probably have been the sanctuary. Again I never saw the interior. What I do recall is that next to Convent Lane was a two storey building which had a balcony facing Broad Street. The down stairs shop was a florist and they used to put roses out in buckets daily. Attached to the balcony was a double faced clock which faced the traffic. I checked the 1968 Durban Directory for details and came up with the firm M. Powell, Jewellers and agents for Rolex and Omega watches. Hence the clock. The florist was Burgess ( associated with Jesmond Dene the well known rose growers). The two storey building is given as Highway Court but this I cannot recall. I then checked the 1938 Durban Directory and what later became Highway Court was then Highway Hotel owned (?) by W.H. Hammond. Convent School (St Andrew’s St.) will turn 100 next year! I was very interested to read this as my great grandparents were married in St Joseph’s Church Durban in 1898 by a P Gourlay presumably the priest at that time. They were from Lancashire in the UK and had come out to teach in the Government School in Estcourt and later Charlestown. I only had a record of their marriage from his Estates Papers following his death in England in 1943 which listed the place of marriage as “Durban Cathedral” but when my research showed the cathedral was not built then I was confused. Having recently found a copy of the marriage certificate on the Family Search website giving St Joseph’s as the place, your history put it all into context for me. Thank you. Pierre Gourlay 1863-1924 ( date of birth and death) 1888-1924 (years in service under Bishop Jolivet). There is a comment : mostly amongst the Indian Community. Early Oblates were mainly drawn from France, and Pierre Gourlay arrived in Durban with a group of Oblate scholastics in 1880. In 1888, now Father Gourlay, was put in charge of a newly built school for the Indian congregation built by Bishop Jolivet. This was in Prince Alfred Street. Father Gourlay made valiant efforts to master Tamil and remained in charge of the Durban Indian Parish from 1888 to 1891. He continued to live in the Cathedral presbytery (the West St St Joseph’s) until 1901. Owing to urgent requirements for a priest at the new mission at Umzinto he was transferred there in 1901. Whilst at Umzinto, Father Gourlay visited Port Shepstone and there got to hear about the local Chamber of Commerce wanting a cottage hospital for the village of Port Shepstone. In 1897 a group of Kemaria Sisters had arrived in Durban and some had been stationed at the Umzinto mission. These sisters emanated from Brittany France, and were in fact nursing sisters. Encouraged by this Father Gourlay approached Bishop Jolivet who agreed to the proposal of a hospital being built and staffed by the sisters. With the help of the Chamber of Commerce, a sanatorium was completed in 1904. Father Gourlay then moved to Port Shepstone permanently. From Port Shepstone, Father Gourlay was moved to Pietermaritzburg in 1912 where he was appointed pastor to the Indian congregation and remained there till his death. (with acknowledgment to JB Brain “Catholics in Natal II” ) published by Archdiocese of Durban 1982. The St Joseph’s Church in West Street at the time being the “seat” of the Bishop would have been known as the Durban Cathedral, this name being transferred to the “new” Cathedral when it opened. Bishop MJF Allard was the first Vicar Apostolic of the Natal Vicariate consecrated as Bishop in Marseilles France 1851. In 1873 he resigned his post whilst in Rome Bishop Jolivet, was the second Vicar Apostolic of the Durban Vicariate from 1874 to 1903. He was replaced by Bishop Henri de Lalle who was the third Vicar Apostolic from 1904 to 1946. His successor was Monsignor Dennis Eugene Hurley who became Bishop , Vicar Apostolic in 1946. He was then 31 years old and the youngest bishop in the Catholic Church at the time. In 1951 the Natal Vicariate was upgraded to an archdiocese and Bishop Hurley took on the title Archbishop. He retired as Bishop in 1992 reverting to a parish priest in the diocese. He died in 2004. Cardinal Bishop Wilfrid Napier is his successor. Jolivet, de Lalle and Hurley are all buried in the nave of the Durban Cathedral. How interesting! I attended the old St Augustines School for Coloureds (at the site of the Cathedral Parish Centre), which was run by the Holy Family Sisters who lived in Convent Lane. Sr St Peter was the Principal. St Joseph’s school kids, in their green uniforms, used to attend First Friday and feast day masses in the Cathedral along with us, and sat on the right hand side of the church in front of the girls from Convent High. Years later, my daughter actually attended Convent High School in Glenmore. This history is so interesting. Well done all. I am pleased to say the Bishop de Lalle put his hands upon me when he confirmed me…God bless his soul…. A Question: In St Joseph’s Church in Stamford Hill, was there a large white marble museleum where Prince Imperial was held until the ship arrived for him to take him to England in 1879 ???? Can someone please tell me what primary school an African boy might have attended outside of the Bantu Education System in the period 1979 to 85? I gather from reading some of the posts here that St Francis Xavier’s on the Bluff might have been open at this time. Would this be the case and what might have been the selection criteria (among other things i understand the government of the day passed legislation around about this time requiring pupils to belong to the denomination for which the school was established). I would be most grateful for any information on this subject. Hi Louise your post of three years ago. Springfield Convent in Wynberg, Cape Town was first school in SA to open it’s doors. Other Catholic schools followed a year or two later. I have a wonderful cartoon of the sisters being challenged by the PM of the day. Will find it and get Allan to post up. Government schools opened up in the late ’80s after our daughter started school which was in 1988 (she attended Springfield through to matric). You pose a difficult question and unless some one who was in eduction at that time answers, I think your best bet is to find someone who was. 1979-85 covers a primary school period; 2 years in the Grades then 5 years in the Standards. Today’s Grade 1 to Grade 8. I cannot recall exactly when schools became integrated but thinking of my own son’s school career which ended in 1993, integration took place some time around 1991. This was across all grades. Before that schools were separated along racial lines, Indian, Coloured, Black and White. As far as I know, never did the Government of the day ever pass legislation that Catholic schools, for instance, were only to admit Catholics. I have never heard of a school policy that segregated pupils on religious lines as well. re St Xavier’s School on the Bluff. It has the distinction of being the first African school in Natal established 1878. It was started and run by the Holy Family Sisters. I have no idea if it is still in operation and if not, when it closed down. I was at St Agnes until they closed at the end of 1976. Sr Magdelen was the principal and Sr Rosemary was the music teacher. The premises were later used by the German School before they moved to their new premises. Hi Mariette Gee what a small world!! I was in your class at St Agnes and remember you very well!! I was only looking at our class photo taken in 1976 the other day. If I remember you have 4 brothers and one sister? My brother Darren was in your younger brother Dennis’ class. I’m now living in Perth, West Australia. whereabouts are you? To Gerald Buttigieg. Read with great interest articles on St Joseph’s School, and the old church in Stamford Hill road. I was a pupil at the Convent in St Andrews Street but well remember the nuns living in the convent at St Josephs. Regarding the Oblate fathers arriving in Natal, I could recommend your reading “For the sake of Silence” by Michael Cawood Green. It has a fictional story line but most is historical fact, and although dealing mainly with the founding by the Trappists of the monastery it also deals with the arrival of the Oblates. Your mention of the late Archbishop Hurley makes me also recommend “Guardian of the Light” by Paddy Kearney- a truly illuminating biography. I was a student from class 2 to standard 5 at St Agnes. 1963 to 1968. I played Soccer and sadly the play grounds were tar, so we had to walk down Argyle Road across Umgeni Road cross a few railway lines to the fields on Kingsmead for training twice a week. We had a coach , the only male teacher at the school, cannot remember the name. We never saw him at training and never at a game. We lived in Woodlands and used to have to take 2 buses each way to school. Spent some of my happiest days at St Agnes. Thanks for your info. In the Recent Posts, Lorraine Myburgh also writes about St Agnes becoming St Joseph’s. I was not aware of this if it is true. Your dates 1963-1968 tie up with my memories as I left the St Joseph’s parish in 1970 and St Agnes was still operating then. I do not have any idea when the school closed but it stood empty for some years in the 1980s if I recall. My next memory of it, it became the Deutsche Schule (German School) for a few years. I cannot say what its present fate is but it was still standing up to a few years ago. I know for sure from a Holy Family magazine St Agnes dates back to 1905 so it was one of Durban early school establishments. Hi Gerald, St Agnes was the school and the church next door facing Stamford Hill Road was St Joseph’s Church. It feels like only yesterday that I was at school there. One thing I remember in 1967 and 1968 we all went to the Greyville Race Course for our Sports Day. The Big race the 880 yards in 1967. Only Std 5 could run it. In 1968 we did the 440 yards and we must have looked so stuffed , Sister Magdaline ( not sure of the spelling ) she said ” NO ” to the running of the 880. Now something not to do with school. Two years later as an Unofficial runner 14 years old I ran and finished the Comrades Marathon in under 11 hours. My grandfather schooled at St Francis Xavier, his name was Vincent Biggar, circa 1914, go to website of the church, it has history on it. Hallo to all the contributors to the topic. I am enjoying the updates. I attended the original St Joseph’s school on cnr. Smith and Broad 1956-1958 (Class 2 to Std 2) – before it moved to the Convent School site in St Andrews Street. Every Friday we crocodiled to the Emmanuel Cathedral for mass. My first communion was at St Josephs. Later on confirmed by Archbishop Dennis Hurley. Should anyone be an ex-St Joseph’s School pupil join the facebook group, St Joseph’s Primary School. Apart from meeting up with contempraries of almost 60 years ago I was reminded that for PT we went across the road to the SOE Hall! When I was at Park View we played soccer against St Agnes at Kingsmead on Saturday mornings. When did St Agnes close? Hi Rodney, St Agnes closed at the end of 1976. My sister Lenny Douwes and I attended St Joseph’s School 1957-1962 = Std 3-Std 6. I remember going to The Cathedral every Friday for Mass. I was confirmed at the Cathedral too. I remember the SOE Hall where we girls had a film about ‘Periods’ etc. Lenny & I went to Durban Girls High school later. Sister Clements was our Principal at the time. Lenny and I both live in Berkshire in the UK now. Kitty Hooey nee Douwes. Hi all, I attended St Agnes school probably from around 1960/61 to 1965/66 ( Std 5) and I well remember walking over to the airfield with Brian Kepplar, Les Sullivan, Emil Loffner and others to play informal cricket games on the cement strips. The teachers that I remember were an American Mrs Beaupre ?, Sister Agnes and Sister Magdelene. I also recall a Father Boardman. Other school mates I remember were Jimmy Porter, Colin Riddle, David Geary, Norman Nunes, Mervyn Beetar, David and Norman Payne and two rather large red head brothers whose names escape me. There was also my first love (she never new) June Molloy and another favorite Matilda Matari or Batari correct spelling anyone’s guess. In those days a lucky couple of boys had “buzz bikes” Itom ( red & white)and Grelleli 50cc ( green & white). We also attended our first “session” at the new hall on the other side of Argyle Rd. The “new” St Joseph’s Hall was opened, I think in 1961. I cannot recall when it closed as I had left the area but do recall that the whole hall was demolished when it was sold. It was bought by a motor dealership and was a Mercedes Benz outlet. It was not that old either. Father Boardman was an institution at St Joseph’s Church serving there for many years. He was very much into youth soccer. Regarding buzz bikes I think the names are Itom and the Garelli, both much sought after Italian makes at the time. As you say you were indeed lucky to have one at that time. Of the names you mention I recall the Beetar family and knew the Paynes, David I think is living in Australia. Hi gerald , David Payne is indeed living in Oz but visits now & then. Racing in the blood. If my memory serves me right David married a girl who lived in Harvey Road near Sutton Park. This was prior to their emigrating. For the life of me I cannot recall her name but her face comes to mind. Correct me if I am wrong. Thanks. I seem to recall your sister worked at Telkom for some years. Were you not in Telkom as well at one stage? I seem to remember you were the Mayor of Queensburgh, did not know you were the last. Google “Durban Street name changes” and look for the Ethekwini Municipality website for the full listing. I worked for the Department of Post and Telecommunications from 1973 to 1981 finishing off at Central. I was a STE. Then moved into selling life Assurance 1981 to 2002. In that time I was also into Local Politics. Belinda, you are right also worked at Telkom. She now runs her own swim school. Only the boys, Mark, Dave (me ) and Jeffrey went to St Agnes, My sisters, Belinda, Angela and Barbara, they went to Montclair primary. At least my memory cells are still functioning! Telkom is now totally transformed and I do not think you would recognise it today. All of the auxiliary staff have been “paid off” as well as most of the staff in all sections. If you saw the condition of the outdoor plant today especially out in the rural areas where most of the cabling, even the poles, have been stolen and removed you wonder how the system carries on. The whole network and here I speak nationally is now controlled from Pretoria who direct the few remaining staff where to go to attend to exchange problems. Just about every service we offered as “normal service” has now been outsourced. David Payne is now a very successful race horse trainer in Australia. He married Merle, in 1972, who used to live in Durban North, on Northway, if I remember correctly. David did attend St Agnes and came from a very big family (4 brothers and 5 sisters). I have my wires crossed obviously. I was a pupil between 1947 and 1951. My class teacher was Sr. Marie de Lourdes, and other teachers were Mrs. Hall, Mrs. Ducasse (Baking/sewing etc) and Mrs. Martin. Archbishop Hurley had just finished seminary and was our local Priest and would take morning prayers. We had Sr. Bernadette teaching the young children. This was a wonderful period of my life and I am extremely grateful to the teachers I had during this time. Are u any relation to Shirley Gourlay? I remember her having lovely blonde red hair and being a little reserved. For the life of me, I cannot remember whether it was at St Joseph’s Junior School or Durban Girls’ High School. St Agnes School what wonderful memories. I attended St Agnes from 1954 to 1959 – Class 1 to Std 4. My two brothers, Allan & Kevin were at St Agnes as well. In fact I think Allan was in the last Std 6 class at St Agnes. The following year the school only went as high as Std 5. I remember some of the boys in my class were David Payne, Sydney Benjamin, David Geary and John Johnson. The only girls I can remember were Pamela de Silva and Mary Powell. Whilst in Std 4 the boys had to catch the bus to Morningside School in North Ridge Road for woodwork classes. This is so interesting…I was a pupil at St Agnes from 1957 to 1960. Class 1 to Std 4. I remember Miss Williams taught me in Std 1. She was a large lady! I think it was Mrs Meyer in class 2 and Sr Anthony in Std 3. I remember Father Boardman addressing the school in the quadrangle one morning and putting the fear of God into me , he was trying to find out who had scratched the floor in the new St Joseph,s church hall and was very angry about it. I remember the big wild fig tree in the quad and the wire fence between the church and the school playgound. I lived in Durban North and used to catch the bus in Umgeni Road to Durban North. I left in Std 3 and went to Fatima Convent on Northway till Std 7 then went to the Tech to do a commercial matric. My name was Claire Maidment. I am sure Father Boardman coached St Agnes or St Josephs soccer team???. I might be wrong!!! I was at St Joseph’s School From Std 3-6 : 1957-61. We had no money to pay the fees for Convent High in St Andrews Street, so we went to Durban Girls High School – my sister Lenny and me _ Kitty Douwes after that. In Std 6 I was ‘Prefect of The Boys’ so my friend Claire Tomilinson now Oosthuizen were on duty in the Boys’ Playground every day. Sister Clements was our Head Mistress. Domestic Science Teacher = Mrs Ducase. Class Teacher = Miss Sheila Walker. I remember walking to The Cathedral for First Fridays etc. Those uneven stones in the playground because of large fig tree. The beautiful chapel. The giant white statue of St Joseph at one end of the playground. The Chapel was also used the first Sunday of every month for Mass for the Dutch Community – we were a Dutch Family. I am still friends with Tessa Zarb and Claire from those days. Wonderful Memories. I now live in Ascot in UK. Kitty Hooey nee Douwes. Thank you, Gerald. So well researched and interestingly written. I, too, went to Saint Agnes – just for one year. I had Mrs Nash in Std 6 in 1959. Gerald Grove is right about Sister Magdelene (principal) and Father Boardman. There was also Fr. McKinnon who once slapped my face for insolence. I think Miss Beaupre (Miss, not Mrs) was a Canadian from Quebec. There was also a very tall (to me) Sr. Anthony who once slapped me on the wrist. Mrs Knudsen taught Std 5. Miss Beaupre once gave me ‘cuts’ with a dowel cane in Sister Magdelene’s office. I suppose I must have been an extremely naughty guy 😉 As mentioned by Dave Upfold, we also had school sports day at Greyville Race Course in front of the main stands. We were bussed there – and then abandoned. I had to walk home that day – my home being in Umbilo near Stellawood Cemetery. I should add that my father (Denis McCann) was a pupil at St. Joseph’s Convent School in Saint Andrew’s Street sometime well before the War, after which he went to Saint Henry’s (Marist Brothers). Oh my goodness. I remember all those teachers. I started at St Agnes in Class one at age 5 in 1954. Sr Anthony was tall and lean from memory. Our domestic science teacher was Mrs Cookson. Rev. Fr. Basil G Royston, D.Min. Gerald – Have you contacted the archivist at the Archdiocesan Offices adjacent to the current St Joseph’s Church to look for photos of St Joseph through the ages? I am sure you will find some photographic gems and historical nuggets to add to your captivating blog. Actually I have not and should take you up on that. There is a lot of history that goes with St Joseph’s and if one goes further back there was the ambush of the French Prince Imperial during the Zulu War resulting in his death. His body was brought down to Durban and lay in state at the first St Joseph’s Church until it was shipped back to France. Thanks for the prod. Just for info, my neighbour here in Byrne is Father Rodney Moss. My older brother, who lives overseas, sent me your well researched and fascinating blog. I have a feeling that I may have seen other Durban blogs which you have listed? Just to add my tuppence worth, my family actually lived at the Highway Hotel, for a few years, which apart from the mediocre food, was a novel and interesting experience. We had a small suite of rooms including a half-covered balcony on which my brother and I slept. I can recall hearing the horse-drawn ice cart trotting up Broad Street, in the early hours, with one of the two occupants sawing up blocks of ice! My older sister and brother attended St Joseph’s convent, in the early fifties, where I joined them in about 1953/4. It was a quiet area in which to live and we spent a fair amount of our weekends and spare time either at Albert Park ( which was then a delightful and safe place) or strolling up to the Durban municipal library to borrow books, as we were all three avid readers. I also recall marching up, in crocodile formation, to the Emmanuel Cathedral, for first Friday and holy days Mass and marvelling at the mysteries of Ajmieri arcade. My brother and I both completed our primary schooling there ( up to STD 2) before going on to St Henry’s for a few years, while my older sister stayed on till STD 5 or 6 as girls were able to remain at the Convent up till that year. Some of the teachers I recall, from our time there, were Sisters Bertmands, Carmel and Brendan, Mrs Hucklebridge, Spicer, Shepherd, Royston, Fincher and Miss Farrant and the principal, Sister Clement. Those were the days of free school milk and occasional ice cream wafers at tea break, medical checks, held at the school, and school meals if your mother did not give you a packed lunch! We were fortunate as our mother provided us with excellent lunches. Were you in the Durban Passion Play by any chance? The Ribiero Family were ALL in it. Joe now lives in San Francisco & is retired. Thanks for your post and it seems we trod the same path albeit mine a few years before you. Your comment re the Highway Hotel in Broad Street did not ring a bell as I could not remember one being there. 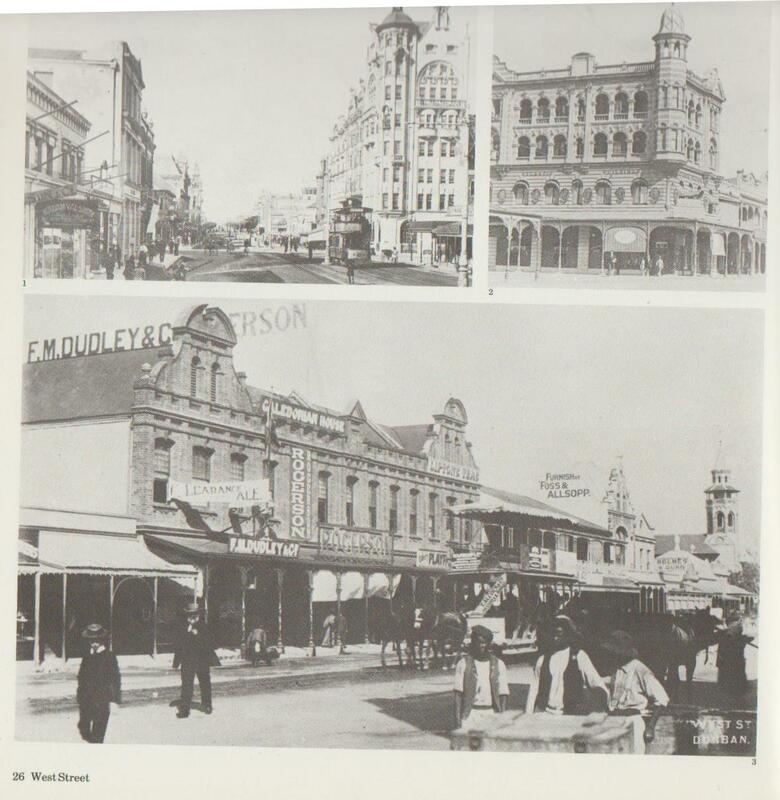 However fortunate enough to have some old Durban Directories I see the Highway Hotel was at 95/97 Broad Street. This building had M Powell & Co Jewellers as well as Jesmond Dene the Florists at ground level. This I remember well and the fact that the building had an open verandah above the shops. In my 1965 Directory the Hotel is no longer listed but Highway Court replaced it. The Ribiero family still around. I knew Sadie (larger than life) and her husband, the daughter Cecelia, her late brother Mickey and younger brother Joe. I think there were more children. Re the priests at St Joseph’s I remember were Fathers Sheldon Kelly, MacKInnon, L’Hennoret, Boardman, and Boggis. Hello Erik, was Maric Glaser your elder brother, and didn’t you both attend Grosvenor Boys’High? If so, you will find him in our 1963 class photo in the “Durban Schools – Matriculation Classes” thread. Please pass on my greetings and best wishes to him. Kind regards, Frank Beeton. Hi Gerald, I also recall both the jewellers and the florist as the area around the then Highway Hotel was our ‘playground’ and, in those days, entirely safe. Our dad used to – occasionally – take us to the Roxy ‘bioscope’, just around the corner, in West Street, where they showed movies on a continuous loop. I recall Father Boggis quite well as he was a friend of a now deceased mutual colleague Tommy Vogel. Was there a priest who you remember whose name was Father Kemp? I knew a Father Boggis at Trinity Catholic Church in Musgrave Road. But he left the priesthood if I remember correctly. Kitty Hooey nee Douwes. Kitty, Fr. Boggis was at Trinity in Musgrave Road. I remember being told he smoked Gauloises which impressed some of my friends. Yes I remember Fr Boggis at Trinity. Did I give another name for the church? I still remember standing outside the church waiting for my brother one Sat afternoon with a group of friends after Confession. Jan was the last one out of the confessional. Then Fr Boggis came out, called Jan to one side, & went through his confession with him !!!!!! Jan was livid & never went back to church after that!!!! Dear Fr Boggis did not have a happy ending if I remember correctly. Sadly Sadie and her husband have both passed on. Her one daughter Cecelia inherited her voice. She lives in Hillcrest. You may enjoy some of my memories of Durban in the 60s. Just do a SEARCH for Roxy I am sure it will come up. Father Kemp does not ring a bell at all. Hi Erik, you are thinking of Colin Craig who arrived at school in several “interesting” cars including an Aston Martin! Sadly he was killed in a sailing accident off Australia some years ago. Brian Widdowson was indeed in our class, I believe now retired after a long career in the Durban Municipality. Unfortunately he declined to participate in the 50th Anniversary of our Matric class that was held in 2013, so I cannot provide any more details. Tiny Fourie was also in our class, and returned to repeat Matric in 1964. He and I have shared an interest in motor sport since school days and we are still in regular contact, I am sure that he will be pleased to be remembered as an athletics hero! Hi Kitty I remember you and Lenny so very well . I was in your class at St Joseph’ s my name Arlette Gallet. I remember those walks to the Cathedral and passing the pet shop. Wonderful happy memories at St Joseph’s. Yes I do remember you from St Joseph Days. And those walks to The Cathedral. I had not thougt of the pet shops in years but now I do remember them. I am sure we did contact each other many years ago. I would like to hear how your life panned out after St Joseph’s. Did you go to Convent High while I went to Durban Girls’ High ??? I do not have anything specific but will look through my late father-in-law’s scrap books for those years . I looked through the years you mentioned but nothing had been pasted into the books. 1961 was my last year at St Henry’s and the bus used to pass the Sanatorium as it was called then. One would see the nuns out and about on the verandahs. There was a statue on a plinth of Christ as you drove in. Are you talking about St Joseph’s Junior School on the corner of Broad Street and Smith Street? I was not aware that this was at one time a maternity hospital ?? The nature of Facts about Durban is that topics can get confused when people reply to posts that actually are not related to the topic. Sheila is talking about St Augustine’s Hospital in Chelmsford Road . This particular post refers to St Joseph’s Church. The Catholic Church owned the whole plot of ground between West and Smith Streets and bordered by Broad Street. St. Joseph’s School (getting its name from the Church) was built on the frontage facing Smith St. The Church was built fronting West Street. Do a SEARCH for St Joseph’s and my write up on the school with picture should come up. So St Joseph’s School was never a maternity hospital but today it is the site of the Durdoc Centre. Dear Gerald – I am aware of this information. Maybe I read Sheila’s mail incorrectly. But I thought she asked for informaiton on St Joseph’s hospital during 1964-68. My apologies.